Andres Roots Roundabout: Record Store Day Release! 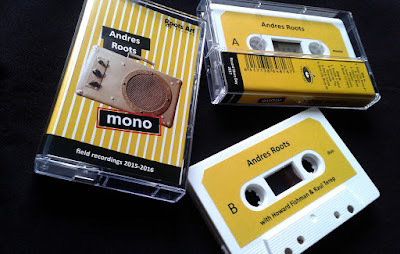 April 22 is the 10th Record Store Day and for that very special occasion, Roots Art Records will put out a very special cassette: Andres Roots "Mono"! Side A is Andres Roots solo: 1. Soup City Blues #1 2. Django 3. Station Blues Medley 4. Room Service 5. Blues For Halvo. Side B features Howard Fishman on two tracks and Raul Terep on another two: 1. Trouble In Mind 2. Down By The Riverside 3. Roll & Tumble 4. Soup City Blues #2. The album consists of live "field recordings" made in Tartu, Estonia in 2015-2016 by Sirje Penjam and Kalev Toom, with "Blues For Halvo" the sole studio cut, recorded by Jaan Tamm as a demo for a 1920's 7-string guitar, renovated in 2015 by Halvo Liivamägi for Ilmar Oja. The cassette release is limited to 100 copies and distributed by Playground Music Estonia.